Temporomandibular joint (TMJ) also known as craniomandibular joints, is a peculiar bilateral joint articulating between the cranium and mandible. Patients scheduled for maxillofacial surgical procedures may pose a peculiar challenge to the attending anesthetist. One of such challenges is limited mouth opening and difficulty in securing the airway. These challenges can present in the form of limited mouth opening leading to increased difficulties in securing the airway. In patients with limited mouth opening scheduled for oral and maxillofacial surgery, nasotracheal intubation with the traditional laryngoscopy or video laryngoscopy may be difficult, if not impossible. During endotracheal intubation, the anesthetist typically attempts both rotation and translation of the TMJ to allow for maximum opening of the patient's mouth. This becomes easier when suxamethonium is used to facilitate intubation. This maneuver allows for a successful visualization of the epiglottis and vocal cords, and consequently the atraumatic passage of an endotracheal tube. The options advocated include fiberoptic bronchoscopy, semi-blind nasal intubation, retrograde endotracheal intubation, bi-nasopharyngeal airway, a fluoroscope-aided retrograde placement of the guide wire for the tracheal intubation, tracheostomy., In children with TMJ, the incidence of difficult airway is between 1.2% and 9%. Patients with TMJ disorder associated with restricted mouth opening may require surgery for the primary disorder or surgical interventions for unrelated disease. Airway management is usually a challenge which should be properly addressed to avert anesthetic incidents and ensuring good surgical outcomes. We, therefore, present the pattern of airway management of TMJ patients who had surgical interventions at Ahmadu Bello University Teaching Hospital, Zaria over a period of 12 years. A retrospective study of both surgeons' and the anesthetists' records of the 36 patients managed at Ahmadu Bello University Teaching Hospital, from January 2006 to December 2017, is presented in this study. Data collected includes: patient's biodata, side of TMJ ankylosis (left, right, or both sides) and type of intubation (fiberoptic, blind nasotracheal, or tracheostomy). They were analyzed and presented in [Table 1] and [Table 2] and bar chart [Figure 1]. Mean age 26.9 ± 1.64 years with the range from 4 to 74 years. There were more male (52.8%) than female (47.2%) in a ratio of male: female was 1.1:1. The most common pathology was bony ankylosis which constituted 61.1% of all TMJ pathologies followed by tumor infiltration with 22.2% [Table 1]. The interincisor gap was between 0 and <1 cm in all the patients which indicated significantly restricted mouth opening, with an average of zero interincisor gap. The incidence of TMJ ankylosis per year is estimated to be 3 cases. A retrospective study of both surgeons' and the anesthetic review, as well as the anesthetic chart of the 36 patients managed at Ahmadu Bello University Teaching Hospital between January 2006 and December 2017, is presented in this study. The most common pathology was bony ankylosis, which etiologies were fall, trauma, and infection. Trauma was responsible for the dislocations. Of the 36 patients with TMJ disorders surgically operated during the period, bony ankylosis formed the bulk with 61.1%. This is <69.7% from Ajike and Omisakin in 2011, from the same center and 28% from Lybia, 22.2% by Vadepally et al. and 1.4% of difficult intubation cases in Turkey. Majority of the patients with ankylosis of the TMJ were in their second decades of life. This happens to be the most active period during which the individuals are exposed to trauma and other causes of TMJ ankylosis such as fall. Tumor infiltration represented 22.2% of all the lesions. In Lybia, Ashmman and Rehab had no case of tumor infiltration. TMJ dislocation is the dislodgment of the condyle from its normal anatomical position in the squamo-temporal portion of the cranial base. It could be spontaneous, trauma, endotracheal intubation, and dental procedures among others. In this study, they represented 11.1% and were due to trauma. The prediction of problematic airway maintenance plays a vital role in patient safety and the prevention of complications. Mallampati scores, thyromental and sternomental distances were among the tests employed for assessment and airway management. The assessment of Mallampati scoring was not possible in this study because the maximum mouth opening was less than 1 cm. A review of the literature suggests that Mallampati score alone has a low sensitivity and should therefore be combined with other tests such as thyromental and sternomental distances. Thyromental distance (TMD) is the distance from the mentum to the thyroid notch with the head fully extended. 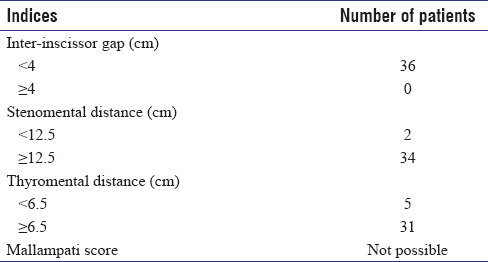 At ≤6.5 cm, it is considered prognostic of problematic laryngoscopy. In our study, the mean (7.1) of the TMDs were within normal range [Table 2] and this agrees with Gupta and Aggawal from India. Val and Sawant reported a shorter TMD (1.5–3 cm) in patients with bilateral TMJ ankylosis while between 3.5 and 5 cm in unilateral and other limited mouth opening conditions. The mean thyromental distance was 7.5 (2.3) in the study of Aktas et al. TMJ problem results in inability to open mouth either partial or complete. It also leads to increased airway obstruction, obstructive sleep apnea and cor-pulmonale., Airway obstructions are secondary to structural encroachment on the pharyngeal and hypopharyngeal lumen, subatmospheric intra-pharyngeal pressure and hypotonicity of oropharyngeal muscles., Inability to open the mouth makes direct laryngoscopy impossible. Therefore, fiberoptic bronchoscopy, blind nasal intubation, retrograde endotracheal intubation, bi-nasopharyngeal airway, a fluoroscope-aided retrograde placement of the guide wire for the tracheal intubation, transtracheal ventilation, illuminator, and tracheostomy are the choices left with by the anesthetist., Fiberoptic from our findings was mostly used 61.1% [Figure 1]. This was higher than the 28% of Ajike and Omisakin in the same center. This high percentage could be explained with the fact that there is improved skill with the use of the fiberoptic bronchoscope in our center. It also depends on the differential time of availability of the equipment in the centers. Wahal Gupta and Aggawal had 100% of their cases intubated through fiberoptic bronchoscope. Tracheostomy was used to access the airway 22.2% of patients in our study, which was lower than the 48% from same center but higher than the 13.91% by Kulkarni et al. and 13% in India. The low percentage in our center could be explained by the high success rate encountered with fiber optic intubation. Fiberoptic intubation was the method used by Kiran et al. for 15/16 of their patients. The technique of blind nasal intubation in our study was 11.1% which was lower than the 87.09% by Kulkarni et al., 24% by Ajike and Omisakin, (though from the same center; ABUTH Zaria), but higher than the 6.7% by Vas and Sawant. However, Vas and Sawant used semi-blind intubation technique for 93.3% of their patients. Blind nasal intubation was used by Kiran et al. for 1/16 of their patients. From our findings, fiberoptic intubation was mostly used in 22 (61.1%) patients; this conforms to the result obtained by Kamat et al. Among all the various techniques of intubation (nasal intubation, blind nasal, fiberoptic-guided, either awake, or under general anesthesia), awake fiberoptic nasal intubation is the safest technique of intubation. The successful intubation of 22 (61.1%) patients with fiberoptic bronchoscope makes the technique as the ideal method of intubating patients with TMJ disorder associated with restricted mouth opening. The mainstay of difficult airway management remains flexible fiberoptic intubation. Transnasal fiberoptic-guided intubation under sedation or inhalational agents with spontaneous respiration is the safest approach to intubation. Fiberoptic intubation was the most used approach of achieving tracheal intubation in patients with TMJ disorder. However, where fiberoptic intubation failed, surgical tracheostomy becomes inevitable. Cricothyroidotomy or mini-tracheostomy is the gold standard in rescue emergency airway management. Neelima AM. Ankylosis of temporomandibular joint & its management. In: Text Book of Oral & Maxillofacial Surgery. 1st ed., Ch. 22. India: Jaypee Brothers Medical; 2004. p. 207-19. Kumar B, Fernandes A, Sandhu PK. Restricted mouth opening and its definitive management: A literature review. Indian J Dent Res 2018;29:217-24. Lee MC, Tseng KY, Shen YC, Lin CH, Hsu CW, Hsu HJ, et al. 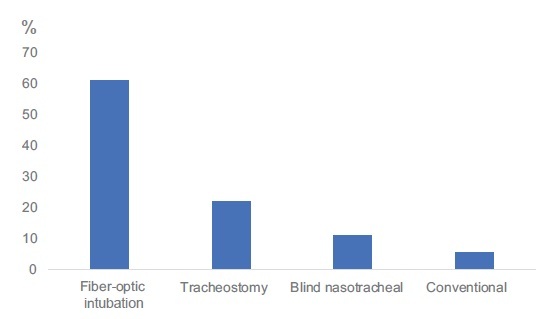 Nasotracheal intubation in patients with limited mouth opening: A comparison between fibreoptic intubation and the Trachway®. Anaesthesia 2016;71:31-8. Beiderlinden M, Eikermann M. The laryngeal mask airway for airway management during percutaneous tracheostomy: Everything should be made as simple as possible but not simpler. Anesth Analg 2007;104:743-4. Kiran S, Eapen S, Chopra V. A comparative study of complications and long term outcomes of surgical tracheostomy and two techniques of percutaneous tracheostomy. Indian J Crit Care Med 2015;19:82-6. Goswami D, Singh S, Bhutia O, Baidya D, Sawhney C. Management of young patients with temporomandibular joint ankylosis-a surgical and anesthetic challenge. Indian J Surg 2016;78:482-9. Kulkarni J, Shah K, AhadGhaffarKhan A, Khaire S. Anaesthetic management of temporomandibular joint ankylosis without fibrotic bronchoscope – A review of 31 Cases. J Dent Med Sci 2013;8:50-4. Ajike SO, Omisakin OO. Temporomandibular joint ankylosis in a Nigerian teaching hospital. West Indian Med J 2011;60:172-6. Ashmmam M, Rhab M. Limited mouth opening causes and its treatment modalities among peoples in Al-Khoms, Libya. J Dent Med Sci 2018;17:67-70. Aktas S, Atalay YO, Tugrul M. Predictive value of bedside tests for difficult intubations. Eur Rev Med Pharmacol Sci 2015;19:1595-9. Gupta P, Aggawal P. Nasal fibreoptic intubation in children with TMJ ankylosis using sevoflurane. A report of ten cases. Anest Pediatr Neonatale 2012;10:1-14. Vas L, Sawant P. A review of anaesthetic technique in 15 paediatric patients with temporomandibular joint ankylosis. Paediatr Anaesth 2001;11:237-44. Ajike SO, Chom ND, Amanyeiwe UE, Adebayo ET, Ononiwu CN, Anyiam JO, et al. Non-syndromal, true congenital ankylosis of the temporomandibular joint: A case report. West Indian Med J 2006;55:444-6. Wahal R. Temporo-mandibular joint ankylosis – The difficult airway. J Oral Biol Craniofac Res 2015;5:57-8. Kamat S, Raju M, Gupta R, Kamat S. Modified technique of retrograde intubation in TMJ ankylosis. Indian J Anaesth 2014;52:196-8.